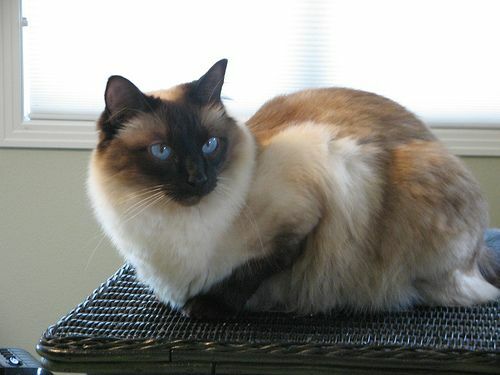 An excellent combination of intelligence, humor, and cuteness, the Balinese with a pleasant personality is a long-haired variation of the Siamese, noted for their soft, and silky coat. Though named as the Balinese, they have no connection with Bali or any other Indonesian region. Coat type Medium length having a soft, fine, silky texture, lacking the fluffy undercoat seen in most longhaired varieties. Eyes Medium sized almond shaped eyes of a sapphire-blue color. 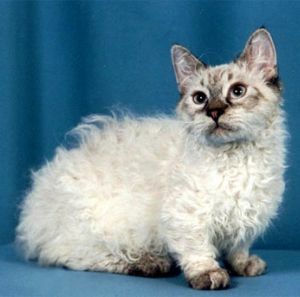 There is little information about how these cats originated, with speculations made that they may either evolve because of a natural mutation of the Siamese or even be a result of crossing the Siamese with other long haired felines like the Turkish Angora or the Persian cat. 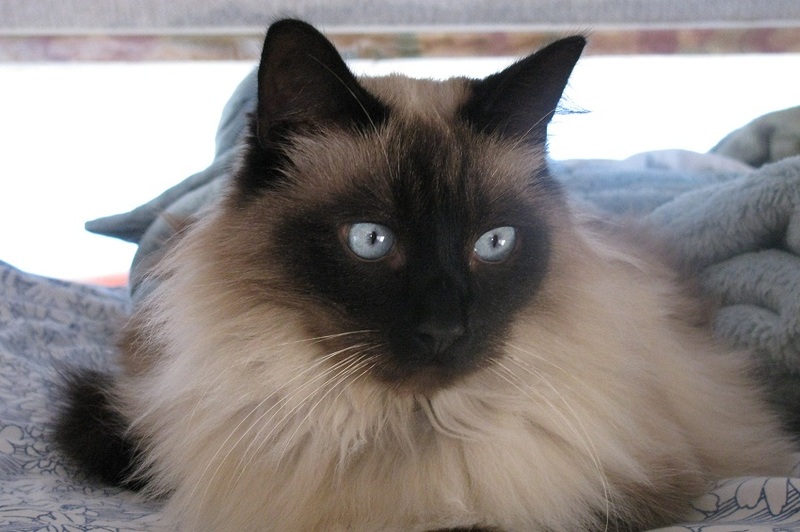 Their development had probably commenced when the Siamese litters, few carrying the long haired gene migrated from Thailand to the United States and the United Kingdom in the middle part of the 1800s. 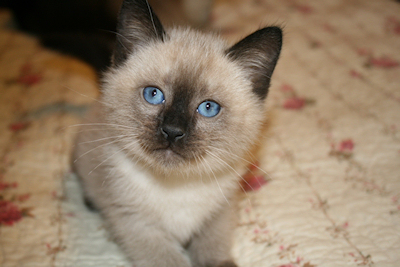 At first, the Siamese kittens with long hairs were not eligible as show cats in the US until 1928, thus mostly sold as pets. With the initiatives taken by a few breeders of different catteries, the Balinese gradually received the status of a separate breed altogether. 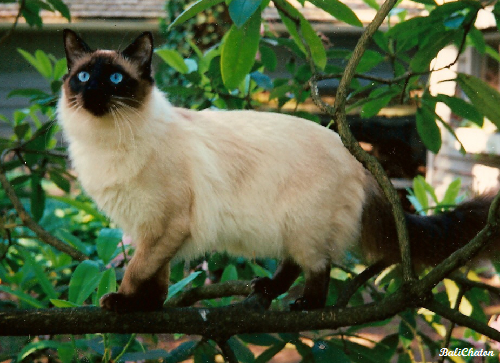 Breeder Helen Smith (Merry Mews Cattery, New York), developed an immense fascination for the long-haired Siamese, giving them the name Balinese as their elegance reminded her of the graceful movements exhibited by the Balinese dancers. 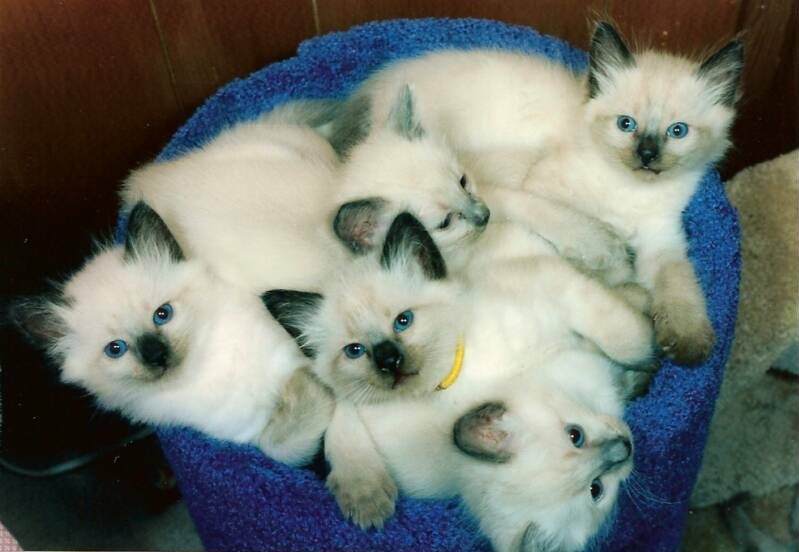 Another breeder, Sylvia Holland (Holland’s Farm Cattery, California), bought the Balinese kitten, Sputnik to her cattery that also went on to become the foundation cat for several Balinese at present. 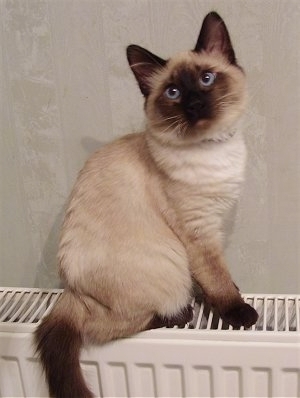 However, cats with lilac, blue, seal and chocolate points were only recognized by her as she felt that the other colors were not truly from the Siamese but crosses of other breeds too. The CFF (Cat Fanciers Federation) and CFA (Cat Fanciers Association) recognized the Balinese in 1961 and 1970 respectively. It obtained Championship Status in 1970, with the first Balinese attaining the Grand Champion Status in 1975. Following the footsteps of their Siamese ancestors, the Balinese were also divided into two groups, the traditional cats with a heavier body stature, later developed into the Thai cat and the modern ones with a slender, elongated body, gaining popularity in cat shows. The kittens develop color variations once they are four weeks old, and the shades get deeper as they grow old. Those dwelling in warmer regions possesses coats of a lighter shade than the ones thriving in the cold regions. The kittens mostly have cream or pure white color at birth with points eventually developing on their feet and toes. Their color points are depicted by the color of their paw pad that is pink for lilac and chocolate points and dark for seal and blue points. Cat associations like the CFF, accept Balinese with chocolate, red, blue, lilac, and cream points alongside lynx and tortoiseshell patterns. 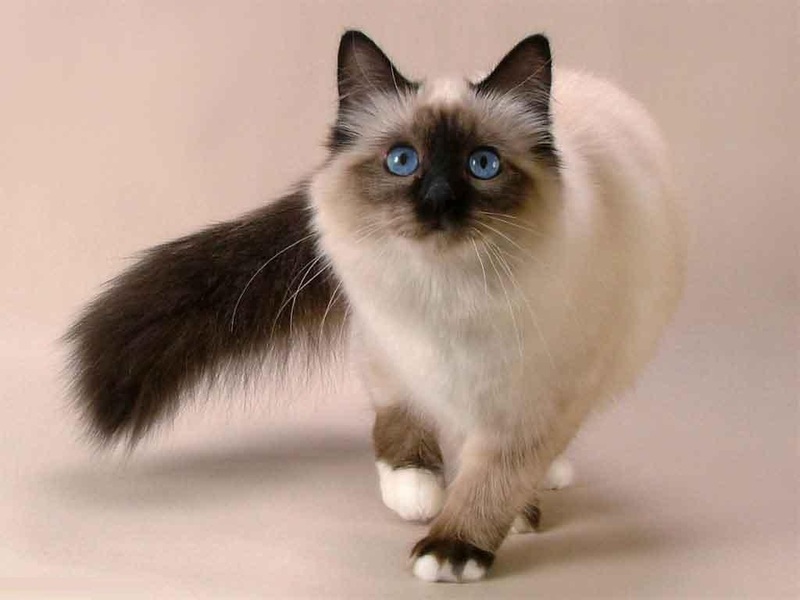 Balinese are set to be hypoallergenic cats, causing minimum allergies in people unlike other long haired varieties as they produce lesser amounts of protein allergens (Fel d1 and Fel d4). However, extensive research is needed to confirm their hypoallergenic qualities. Just like the Siamese, they are fond of human company, loving to chat along with their family members all throughout the day. Have a curious nature, eager to supervise all that is going on in their household. Because of their graceful and agile movements, they are adept at jumping and climbing, leaping onto the refrigerator, television or cupboard tops with ease. They have sharp brains, learning and grasping things with ease. Combined with its sharp observation skills it would take the Balinese no time to retrieve a hidden toy from a closet or drawer. These cats share a friendly relation with children and would love to receive a polite and gentle treatment from the little ones. They are endowed with a clownish disposition, entertaining all with its funny antics. This breed gets along well with other cats and dogs provided the latter accept their authority. For people who do not mind their cat being an integral part and parcel of their daily lives like helping with their chores, following them around the house, jumping onto their laps or snuggling comfortably under their bed covers. Households with kids needing a playmate to play a game of fetching and retrieving a ball or any other toy. Families that have no problem in dealing with a chatter box that would go on meowing all day long. If you desire for a perfect entertainer that would keep you amused with its hilarious antics day in and day out. Seniors who are up and about, seeking for a pet that would give them company. However, it has a tendency to lay underfoot, thus not being a good choice for veterans having problems with their feet or using a cane for support. Never leave objects of your daily necessity in the open as your curious Balinese may have easy access to them. Keeping its climbing instincts in mind, lock all drawers and cabinets as well as keep you silk curtains out of its rich. These minimal shedders need little grooming, sufficing with brushing once a week. Bathe your Balinese when it gets dirty. Other grooming needs include cleaning its ears, brushing its teeth and trimming its nails. 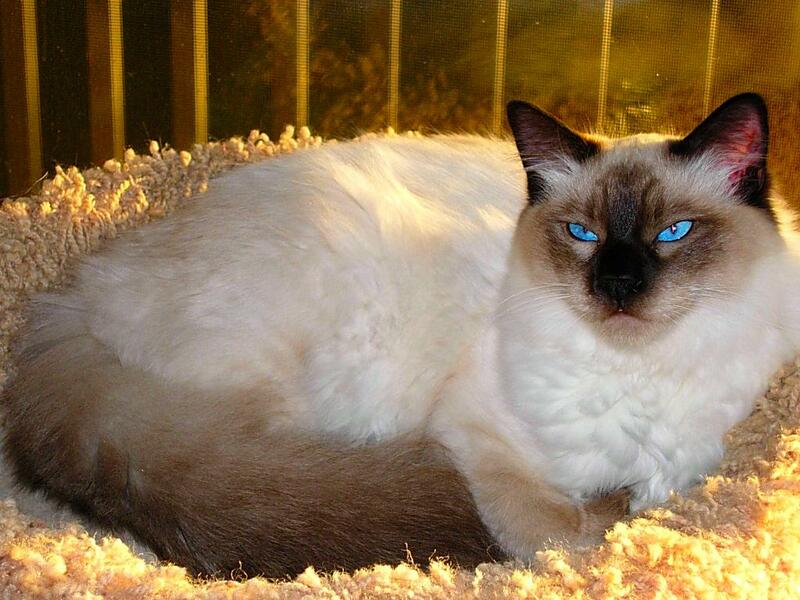 Though it is a healthy breed, it has the chances of being afflicted with the common health issues of the Siamese. Some of them include amyloidosis (protein deposition in the liver or other parts of the body), congenital heart ailments, crossed eyes, gastric diseases like megaesophagus, lymphoma, nystagmus (an involuntary neurological problem where the eyes move in an uncontrolled way) and hyperesthesia syndrome (a rare skin disease). These intelligent and flexible cats may be trained to perform a host of exciting tricks like jumping through a hoop, doing a paw shake, crossing small obstacles like a box kept in the living room, jumping onto a couch or cat tree or even playing a musical instrument that you have like a drum or piano. Positive reinforcement techniques would make the training process easier. A major concern of the Balinese is its vocal nature and continuous meowing. To calm it down you should be indifferent every time it gets vocal as it is doing so to grab your attention. After it sits quietly you can reward it with its treat which will make it gradually realize that it gets awarded for keeping quiet. However, every time your cat is crying try figuring out what it wants so that you can attend to it and quieten it. These cats need a good quality cat food alongside a diet rich in protein and other nutrients. They are also fond of canned food that can be given in moderate amounts. Published on March 31st 2017 by Maxi Gold under USA Cats. Article was last reviewed on 26th May 2017.